Yes, WWII effectively ended the Great Depression on 8 Dec. 41—i.e., the day after Pearl Harbor. But FDR’s policies were working before 7 Dec., and Mr. Proyect should know that. The benefits of the New Deal were relatively quick. By 1936, the U.S. was well on the way to recovery—not overnight, but steady recovery. Unfortunately, at that point, Congress convinced him the Depression was ending and U.S. government stimulus policies no longer were needed. Economic data clearly shows the progress being made. However, as the stimulus policies were cut back, the U.S. slid back into the Great Depression, and economic data show an economy as deeply in depression as it was in 1932. In fact, some of the economic data actually is worse for 1937 that it was in 1932. FDR learned from the and returned to strong Federal economic stimulus policies. The economy quickly began to turn around, once more beginning the climb out of the Great Depression. This upward economic movement continued unabated into and through 1941. Louis also claims the New Deal “did very little to put people back to work outside of the WPA that consisted mostly of make work projects at low pay.” But there’s more to this story as well. As part of his legendary first hundred days, Roosevelt’s first jobs program was actually the Civilian Conservation Corps (CCC), which put men young, unmarried men to work in the national forests, providing employment for 2.5 million people over the next ten years. Enrollees worked 40 hours a week for $30 a month (equivalent to $567 in 2017). There was also a compulsory deduction of $22-25 if the enrollee had any dependents or family in need. Hardly a fortune but in those days $20,000 a year was considered a massive income. Reflective of the times, women were barred from the CCC, while quotas limited black men to just 10% of jobs and they were housed in segregated camps (see, Nancy E Rose, Put to Work: The WPA and Public Employment in the Great Depression). He also defended other New Deal public works projects such as the PWA, the CWA and the WPA. However, both the private and public criticisms do not get to the heart of the question of how the Great Depression ended. The private communication does accept my claim that WWII ended the Depression but gives far more credence to New Deal economics than I would. As for the public criticism, Al Ronzoni sidesteps what I wrote. I certainly recognize the value of public works projects but the real criterion for judging the New Deal was whether such projects made a real dent in unemployment, income and other economic markers that require statistics to judge properly. Well, given the high costs of another world war (after all, those H-Bombs can make a real mess of things), Obama didn’t even create a public works program—the only option open to him. In fact, as I have argued, Obama was inspired more by Herbert Hoover than FDR. As someone who relied heavily on U. of Chicago economists, he was not likely to embark on a new New Deal despite all the advice he got from Paul Krugman, The Nation Magazine, Huffington Post, et al. Vernon starts off by presenting statistics that make it abundantly clear that fully half of the recovery from the depths of 1933 were realized in just two years: 1941 and 1942. Using Department of Commerce data, Vernon makes the case that the recovery was 78.7 to 86.7 percent complete by the end of 1941 but only half-complete (40.8 to 46.0) by the end of 1940. when the recovery still had more than halfway to go. Clearly not a Marxist, Vernon at least supplies the data that underscores Krugman’s appeal to Obama to prime the pump in Keynesian terms even if that presumably meant spending money on infrastructure rather than nuclear missiles. In a table found on page 856 of his article, we see that an additional expenditure of 8.8 billion dollars on federal goods and services (clearly things like replacing the ships blown up in Pearl Harbor, etc.) resulted in a 54.7 percent increase in GNP. That’s military Keynesianism for you, isn’t it? Unlike Vernon, Michael Roberts is a Marxist economist. Indeed, you might even call him the Marxist economist of our time. 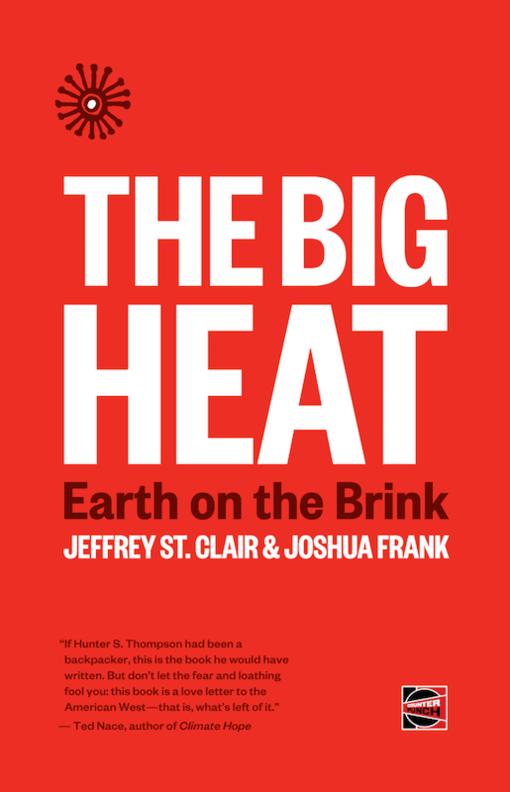 In 2012, he wrote a blog post titled “The Great Depression and the war” that makes points similar to Vernon but using Marxist value theory. For Roberts, the falling rate of profit is the key cause of financial crisis and economic downturns such as the kind that began in 1929 and 2007. 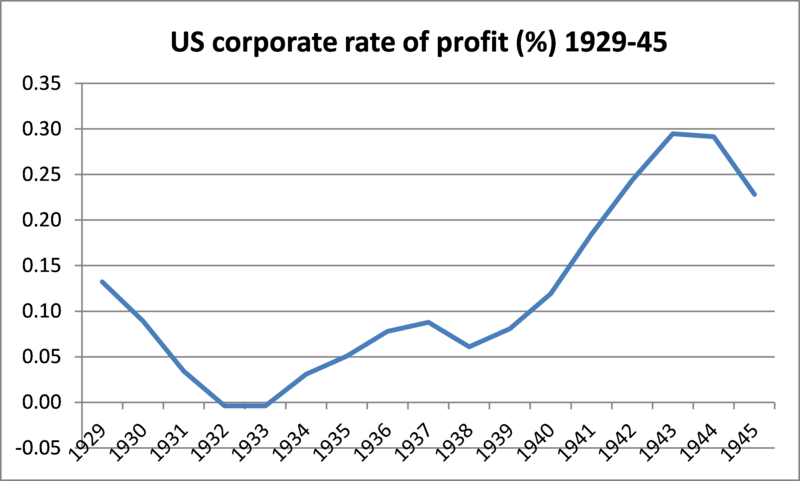 He furnishes a graph indicating that in 1938 the corporate profit rate in 1938 was still less than half of 1929. The same chart jibes with Vernon’s findings, namely that the profit rate rose dramatically after 1940. Vernon agreed that the US economy completed its recovery from the Great Depression in 1942, restoring full-employment output in that year after 12 years of below-full employment performance. However, Keynesian-type fiscal policies were not the most important factor from 1933 through 1940. Only after that did they become the most important factor, when the recovery was less than half-complete. If fiscal policies that conform to the widely accepted definition of military Keynesianism, does this validate the merits of deficit spending even if it is on bombs and tanks rather than schools and highways? The war economy was paid for by restricting the opportunities for workers to spend their incomes from their war-time jobs. There was forced saving through the purchase of war bonds, rationing and increased taxation to pay for the war. Government investment meant the direction and planning of production by government decree. The war economy did not stimulate the private sector, it replaced the ‘free market’ and capitalist investment for profit. Consumption did not restore economic growth as Keynesians (and those who see the cause of crisis in under-consumption) should expect; instead it was investment in mainly weapons of mass destruction. Toward the end of his article, Roberts refers to a long piece by Marxist economist Guglielmo Carchedi that appeared in the October 2011 International Socialism, the journal of the British SWP. Titled “Behind and beyond the crisis”, it was focused on the average rate of profit (ARP) that is key to Roberts’s analysis as well. For old-school Marxists such as Carchedi and Roberts, there is no hope in overcoming a protracted slump like the Great Depression or what Roberts calls today’s Great Recession outside of either a massive war or the introduction of some new technology such as the computer. In Carchedi’s take on WWII, there is recognition that it ended the Depression but an expanding capitalist economy did not translate into a higher standard of living for those building battleships and bombers. Decreasing unemployment made higher wages possible. But higher wages did not dent profitability. In fact, the conversion of civilian into military industries reduced the supply of civilian goods. Higher wages and the limited production of consumer goods meant that labour’s purchasing power had to be greatly compressed in order to avoid inflation. This was achieved by instituting the first general income tax, discouraging consumer spending (consumer credit was prohibited) and stimulating consumer saving, principally through investment in war bonds. Consequently, labour was forced to postpone the expenditure of a sizeable portion of wages and rising wages did not affect the ARP. At the same time labour’s rate of exploitation increased. In essence, the war effort was a labour–financed massive production of means of destruction. You might even say that it was only the conditions that obtained in the post-WWII period that finally allowed working people to enjoy the standard of living that became the envy of the world. The explanation for this, of course, is that the American victory, which cost so little to its industrial infrastructure, put it in the position of number one imperialist power. From 1945 to 1970, it could sell its automobiles worldwide without competition but eventually the recovered Axis powers Japan and Germany would be flooding American markets with their superior products. That’s capitalism for you, a vicious cycle that will eventually destroy us before we create an economic system based on human need rather than private profit.